Connecting your sales force with purpose brings measurable business impact. Research from the EY Beacon Institute and Harvard Business School shows that companies that lead with purpose are 202% more likely to be profitable. Think about your sales organisation. Are your leaders and salespeople set up to achieve their highest potential? Are you? We spend the majority of our waking hours at work, and yet 2 out of 3 of us are disengaged in our jobs. Only 15% of the global workforce reports being actively involved, enthusiastic, and committed to their work, and trust worldwide has fallen to crisis levels. More than just about any other profession, salespeople feel the impact of todays disengaged, low trust world through longer sales cycles, inability to access to key stakeholders, lack of collaboration, and other dysfunctional buying behaviours. There has never been a more crucial time to connect your salespeople with their purpose. Just imagine what would happen if every person was connected to purpose at work - to a job that mattered to them, their colleagues, their company, their customers and the world. Imagine how much more productive and successful they’d be. Think of what we could collectively accomplish. As a leader you have the power to make work more meaningful. You can create engagement and inspiration - by connecting purpose with work. The Brands that will thrive in the coming years are the ones that have a purpose beyond profit. Through our partnership with US based purpose pioneer Imperative, a Certified Benefit Corporation (B Corp) established to bring breakthrough insights on intrinsic motivation and purpose to the workforce, we are enabling everyone to uncover and apply their purpose drivers to realise their potential and accelerate the growth and success of individuals, teams, and entire organisations. Founded by CEO and author of The Purpose Economy, Aaron Hurst and COO Arthur Woods Imperative has already helped more than 100,000 professionals and many of the worlds leading brands awaken purpose in their work and has led the largest global research agenda on purpose. We're excited to have joined the purpose movement by offering our clients access to the worlds first purpose development and learning platform. We help you to measure what generates purpose for each of your employees and equip your leaders to have transformational conversations that build agile, inclusive, and high performing teams. Purpose-Oriented employees aren't just teachers and social workers. They work and thrive in every industry and role - accountants, farmers, designers, you name it. Purpose-oriented employees are the highest performers, often in leadership roles. 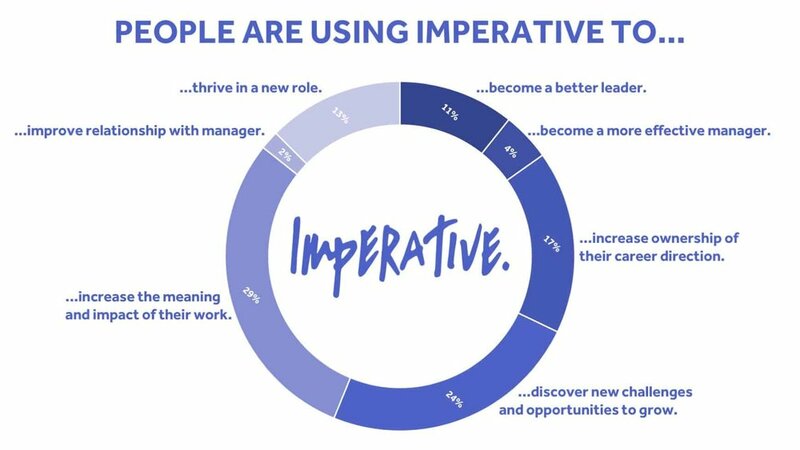 Imperative's breakthrough Personal Purpose Profile is the first comprehensive assessment, report and learning combination to predict what brings purpose to each of your employees. It enables them to build self-awareness around what intrinsically motivates them. This allows employees to tailor their work and careers by using their purpose drivers. Are your team working with purpose? Are you? Find out below. Imperative activates an organisation's articulated purpose by connecting it to each employee's purpose. They are each then able to activate their purpose in service to the organisation's broader purpose. boost their fulfillment and which are failing? Enable employees to discover their purpose - who they seek to serve, how they seek to serve them, and why they are motivated to serve them. 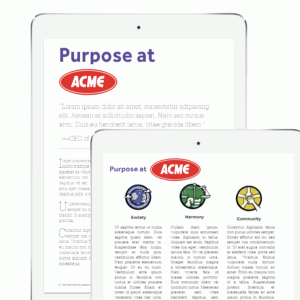 The Individual Purpose Assessment and report provides individuals with clarity about their purpose type and drivers, employees know what truly motivates them and can begin their journey. Purpose-driven employees each have one of three purpose-driven leaderships styles: craft-driven, impact-driven, or values-driven. When they embrace their style they are able to more quickly develop into authentic leaders. The Personal Purpose Profile defines their style and offers concrete tips on how activate it in their work. Develop individual personal purpose statements and stories, an articulation of their purpose assessment results in their own words that they can own. Purpose is at the core of one's identity. 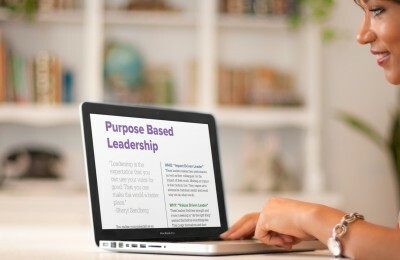 The Purpose Statement Builder enables an employee to describe their purpose in their own words and share it, it begins to define them and give them the courage to lead with purpose. Connect with colleagues in the organisation to uncover their Purpose Drivers. Gain insights into how to best team up, complement work and lean on those of similar drivers for empowerment and support. Act with Purpose using actionable advice on setting goals, growth opportunities to realize potential, ideal opportunities, communication, and collaboration. The individual assessment also provides advice on how to shape their work to maximise their impact and fulfillment. Every employee, when working in alignment with their purpose drivers, has incredible potential and ability to impact the organization's success. But their purpose also creates biases in how they solve problems and engage with their colleagues. The Personal Purpose Profile surfaces these biases so the team can own them and work to overcome them. Our purpose drivers predict what types of volunteering and giving will be the most fulfilling and have the greatest impact in the community. The Personal Purpose Profile provides insights for each employee on how to make their community investments strategic for themselves and the organisation. The Imperative Team Purpose Profile is based on the largest experiment on intrinsic motivation and teams in history. Aaron Hurst, Imperative's CEO, worked for over a dozen years with nearly 2,000 cross-functional teams as the President of the Taproot Foundation. He uncovered what makes teams profoundly motivated and high performing - even when you can't pay or promote them. A team’s purpose is a shared understanding of who the team serves, how they serve them, and why they are motivated to serve them. It provides the team with a shared intrinsic motivation and guide for making decisions and prioritising investments. An opportunity to unlock the power to transform the nature of work, to energise careers, to turbo charge teamwork and collaboration, to accelerate success and to create a better world. Purpose is a choice in our daily lives. Empower your employees and teams to discover, activate, and lead with purpose using Imperative's innovative tools and science. Purpose-oriented sales professionals are the most desirable hires, regardless of your industry or function. They are the highest performers and they are the best leaders. But how do you find and hire them? We have the answer. Are you ready to Hire On Purpose. 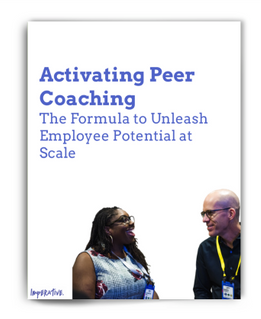 Based on the latest adult learning theory and the growing body of scientific insights about human interaction, Imperative has developed a platform to enable employers to scale transformational peer coaching across their organisation. You articulated your company’s purpose and are excited to launch it to inspire and galvanise your team. This Imperative guide takes your through the three phases of employee adoption and the tactics associated with each one. Where are you on the journey to fully embracing purpose in your talent strategy? Our new Purpose Employer Audit empowers you to quickly assess how far along you are on your journey and where to make your next investments to be purpose-powered. Women are 43% more likely to be purpose-oriented and it is proven that purpose-driven leaders produce extraordinary results. Use this eBook to explore how to empower the women in your organisation to lead using purpose as the foundation for success. Imperative and LinkedIn have partnered to create the largest global study on the role of purpose in the Workforce. Think about your workplace. Are your employees and coworkers set up to achieve their highest potential? Are you? 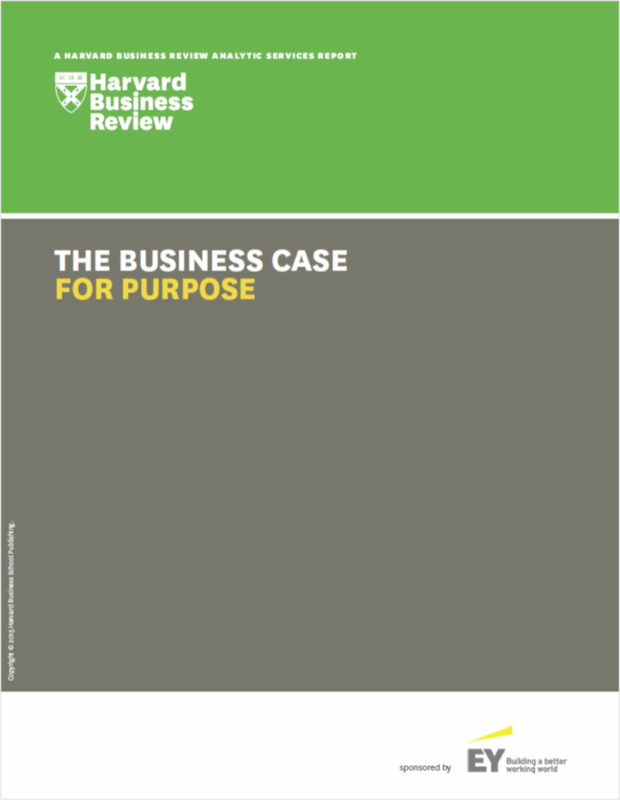 In order to understand why, and more importantly, how, companies are employing purpose to guide and lend impetus to their transformations, Harvard Business Review conducted a survey sponsored by the EY Beacon Institute. 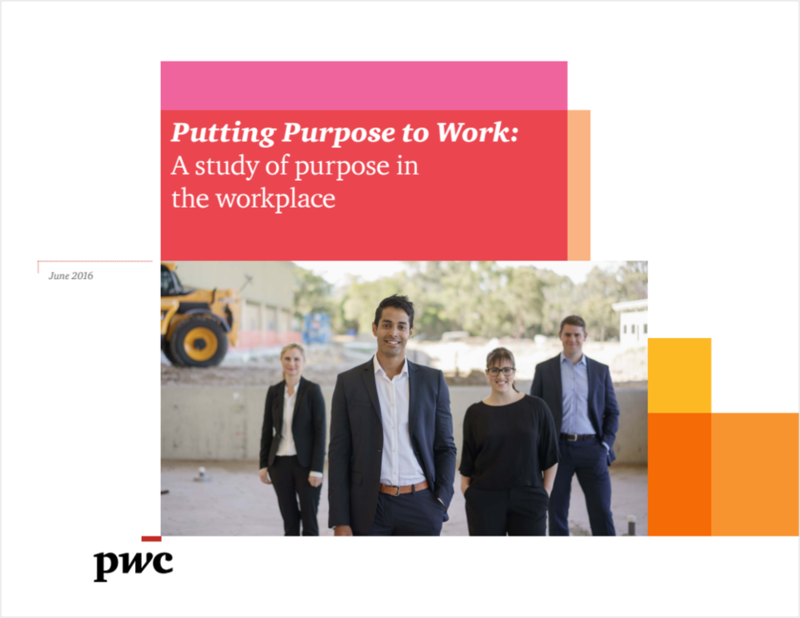 Whether you are already executing your own purpose-led transformation or are interested in understanding this important trend, we hope this report will help bring you a little closer to achieving your purpose. see the importance of purpose in business. How Heineken Mexico's CEO Uses Purpose To Unleash The Power Of His Organization. How YWCA's CEO Dara Richardson-Heron Leads By Taking On Big Challenges. Why Ben and Jerry's CEO Pushes His Company To Merge Ice Cream And Social Justice. How Steelcase Rearranged Its Workplace To Create A Purposeful Office. How SAP's CEO Bill McDermott Is Using Empathy To Build More Powerful Teams. Find Their Superpower To Do Good. LinkedIn leverages Imperative to help their employees grow in their roles and build new career narratives. Your highest potential employees are motivated by more than money and accolades - they are seeking purposeful work. Leverage Imperative to help them grow in their current role, set new personalised goals for their work and transform the way they operate and communicate to derive purpose. VF put purpose to work in their strategy, marketing and corporate sustainability. VF and its leadership understood early on that developing and launching an inspiring corporate purpose was just the first step in becoming purpose-led, performance-driven, and value creating. Beyond discovering the business’ purpose, a second step was to help every associate gain clarity around their own personal purpose – and to link this personal purpose to the organisational one. VF partnered with Imperative to map out a three-part, individual purpose discovery plan. The first step of this plan was to prepare the VF executive team to share how they themselves connected with the VF purpose. Each member of the executive team developed a “personal purpose story” to share at their Global Leadership Conference. After these stories were shared, Steve Rendle, VF Corp CEO, made a public commitment to all associates that they too would have the opportunity to discover their own sources of fulfillment and create an authentic connection to the VF purpose. To kick off that process, each member of the global leadership team was invited to take the purpose Assessment and participate in a purpose workshop. Black Hills Works leverages the team purpose profile to develop high impact teams. Aaron Hurst, Imperative’s CEO, led the largest study in history on intrinsic motivation and teams. He has used those insights along with research from Google to develop the first assessment to help teams lead and operate with purpose at their core. The Team Purpose Profile provides deep analysis for a team on everything from their style to their collective purpose to the opportunities for growth for each member of the team. The Team Purpose Profile also provides insights about where the team will have innate strengths and where it will likely require intentional effort to achieve its potential. MetLife leverages Imperative to develop their high potential women leaders. Investing in purpose is investing in an inclusive organisation. Women are 50% more likely to be purpose-driven and their success is linked to being able to connect purpose to their work each day and grow as purpose-driven leaders. In addition, the Imperative platform identifies and addresses unconscious biases and encourages psychological safety on teams. The Individual Purpose Profile helps individuals identify and articulate their purpose to lead with confidence and better advocates for their needs. The Team Purpose Profile provides managers and team members with insights on unconscious biases to build rich team cultures of psychological safety. The Purpose Hiring Coach gives hiring managers customized, purpose-driven language to use throughout the recruiting process to inspire candidates to join the organization. Leading organisations worldwide are using Imperative's groundbreaking tools to gain in-depth analysis about their purpose and learn how to work in alignment with it. To join them please complete the form below and a member of our team will be in touch.